All Replies on My first bandsaw! Congrats! Pictures when you get it. Brad, I actually watched that video yesterday. Very informative. Can’t wait until Tuesday (delivery day)! -- Why can’t I ever find my pencil??? Get a good quality blade. Grizzly blades are not the best (unless things have changed). Others can comment. Neither are timber-wolfs. Get a good Lenox from Iturra design. It will optimize the performance of your saw. -- there's a solution to every problem.......you just have to be willing to find it. Congratulations on your new purchase. Let us know how you like it. 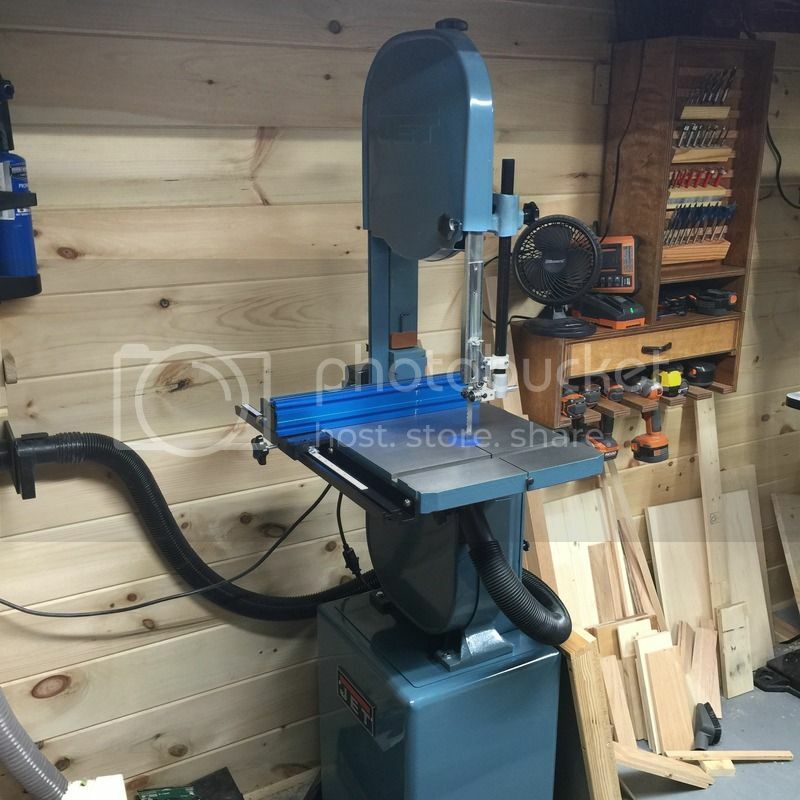 I am in the market for a band saw and I am considering a Grizzly. Your opinion will be appreciated. The bandsaw was delivered today. Glad I had a buddy to help me with the heavy lifting. It is all set up and tuned. I have it on a shop fox mobile base. I didn’t real have a chance to put it through its paces yet. Tomorrow, I will be making some sawdust!!! Just got the same exact model a couple weeks ago. I used some 1500-2000g sandpaper to deburr everything. A nice saw. I got the riser w mine to resaw. Enjoy your new machine! I’m looking forward to your impressions. Now that I have had my saw for a few weeks, I thought that I would post some of my thoughts. 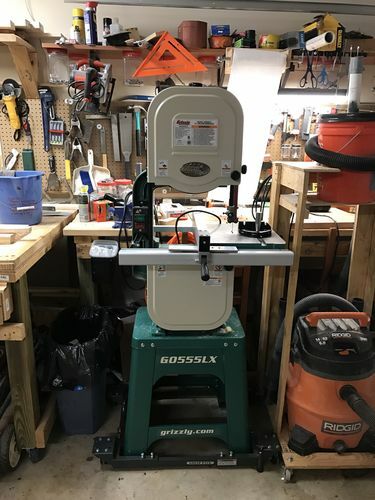 As I stated previously, this is the very first bandsaw that I have ever used, so I don’t have anything to compare it to. That being said, I was dead on when I stated that I was going to be making some sawdust. Wow! This thing makes piles and piles of it! Fit and finish are great. A little tedious to assemble, but not difficult. Fence locks down securely and everything is easy to use. Power is solid. The included 3/8” blade cut through everything that I threw at it. ( I did break that blade within the first week, but I have no doubt that it was due to my lack of knowledge as opposed to any lack of quality). Dust collection port seems pretty useless. I haven’t found no a fitting that will allow me to reduce it to a 2.5” shop vac. I HATE applying any stick on measuring tape. They are ridiculously difficult to get perfect and inevitably vary from actual distances. Also, I purchased a 1/2” Bosch blade from a home center because I am working on a project that requires some resawing. The blade (which had really mixed reviews) bogged down the motor to a complete stop. I also discovered that after the motor bogged down, one of the lower blade guide bearing housings was cracked. I put on the replacement 3/8” blade that I ordered from Grizzly and everything is working fine now. All in all, I am very pleased with this saw and would recommend to anyone. I will be contacting Grizzly about the cracked bearing housing. I also want to reinstall the 1/2” Bosch blade to see if I screwed something up the first time. Hope anyone interested in this saw finds this useful. Now that I have had my saw for a few weeks, I thought that I would post some of my thoughts. As I stated previously, this is the very first bandsaw that I have ever used, so I don t have anything to compare it to. That being said, I was dead on when I stated that I was going to be making some sawdust. Wow! This thing makes piles and piles of it! Dust collection port seems pretty useless. I haven t found no a fitting that will allow me to reduce it to a 2.5” shop vac. I HATE applying any stick on measuring tape. They are ridiculously difficult to get perfect and inevitably vary from actual distances. Also, I purchased a 1/2” Bosch blade from a home center because I am working on a project that requires some resawing. The blade (which had really mixed reviews) bogged down the motor to a complete stop. I also discovered that after the motor bogged down, one of the lower blade guide bearing housings was cracked. I put on the replacement 3/8” blade that I ordered from Grizzly and everything is working fine now. Good luck when you contact Grizzly, but if my past experience is any indicator, you’re in good hands. Their customer service has always been excellent to me. As for your shop vac issue, I found a solution with mine (temporarily) by using the 4” to 2.5” reducer that came with my Dewalt planer, though I did have to put a single wind of painter tape on the bandsaw port to snug it up. I quickly found out that even with a short run to a large shop vac, the dust collection was lousy. Once I put on a dust right fitting from Rockler and plugged in my DC, it worked much better, even through a long hose connected to a weaker DC (the HF 2hp). Also, as far as blades go, if you’re not in a hurry I’d look at Highland Woodworking. I have one of their “green wood” blades on my G0555LANV and it works great. I also have a 1/2” 3tpi from Timberwolf that resaws very nicely. As far as the shop vac connection goes, I cut the end connector off the end of my 2.5” hose and it slides on the port of my Jet bandsaw. It’s a very good fit. I’m not sure if yours is the same. Still not a great dust collector though. Heres an older pic of mine.